If you are looking for a way to replace a missing tooth, schedule an appointment with your dentist right away. The worst thing you can do is move on with life as if nothing happened. Here is a look at the importance of obtaining immediate attention for your missing tooth and the options for replacement. A surprising number of people do nothing about their missing teeth. These individuals are left with an ugly gap in the mouth. Even if you do not care about how you look when you open your mouth, you should know doing nothing will cause problems down the road. Each tooth serves as a placeholder for other teeth. If the tooth is missing from the mouth for an extended period of time, adjacent teeth or even the tooth above or below the gap, have the potential to move and affect your bite. Doing nothing about this problem also prevents the application of pressure to the jaw bone at the site of the missing tooth. This heightens the risk of bone density loss. So don’t assume your mouth will be fine after you lose a tooth. There are plenty of dental options available to replace a missing tooth. A dental implant can replace a missing tooth and provide ample support for decades. The dental implant process involves the placement of a titanium or zirconia post in the jaw bone where the tooth is missing. Titanium is used as it chemically integrates with the surrounding bone. Zirconia is a crystal generated by heating metal zirconium. This means the zirconia used for a dental implant no longer qualifies as a metal, making it that much safer for your mouth. The titanium post connects to the jaw in the following months in a process referred to as osseointegration. Once your dentist determines the post is firmly connected, a crown is placed upon the post. Ask any dentist who has been in business for a decade or longer about traditional bridgework as a solution for missing teeth and you will be inundated with information about the merits of this oral health solution. Bridgework has been used for decades to safely and effectively replace a missing tooth. Traditional bridgework involves a grinding down of the teeth on the sides of the gap to “posts” that are connected to a fixed bridge to form a large chewing surface. The main risk to this approach is the possibility for one of the anchor teeth to be compromised. However, the vast majority of those who have elected for bridgework to replace a missing tooth experience few, if any, problems. Composite bridgework is another option for missing teeth. The dentist creates a bridge with composite resin. This is the same material those lovely-looking tooth fillings are made with. This approach does not require a grinding down of the anchor teeth. 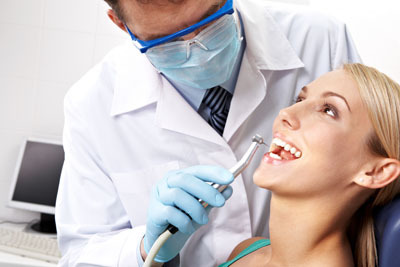 The dentist uses the adjacent teeth and composite materials to fill the gap. Call us at (281) 477-7200 for more information from Pearl Shine Dental or to schedule an appointment in our dentist office in Houston.